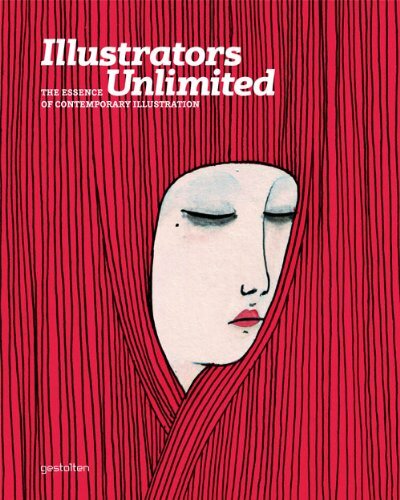 The cover of this upcoming book Illustrators Unlimited is striking with its strong colour. It looks like a great book judging from the preview pages. The illustrations are beautiful and varied. It reminds me of The Illusive series which are also very good. The book's a 288 page hardcover published by Gestalten. It should be available end of Oct 2011. In recent years, illustration has evolved from a purely service-oriented trade to an expressive, poetic, and esteemed voice in contemporary visual culture. Today it continues to burgeon as a creative discipline––especially in its more artistic forms. Editorial design increasingly uses illustration in place of photography because it depicts and enriches content in a way that offers an expanded dimension of communication. Illustrators Unlimited presents the work of cutting-edge illustration talents scouted from around the world. They are working independently from fleeting trends and represent the best of the virtually inexhaustible possibilities of styles and techniques that are practiced today. The book is structured according to the featured illustrators. Each one is introduced with a variety of representative examples of his or her work plus a text portrait written by James Gaddy, a former editor at Print magazine. Whether created by established names or fresh talents, the work collected here has been chosen solely for its artistic merit. The lavish images covering page after page and insightful accompanying texts make Illustrators Unlimited a comprehensive overview of contemporary illustration. The book is a definitive reference for clients looking to commission work, for agencies, and anyone else who is interested in this multifaceted creative medium. Pricey but I really like this. So many Charley Harper-esque inspired styles nowadays that's floating around in the industry, or is it just me?